Chirihama has one of the best the Sunset of the Sea of Japan (千里浜の夕日). This is located in Ishikawa Prefecture. Because this beach is 8km long and facing the west, you can see great the Sunset view. There are many many parking space and restroom. Note: Be careful when you drive. Don't drive too fast. Make sure you drive on the tight sand or you might stuck on there. You can drive all the year, but during the summer, there is low speed limit for the safety. 1. use JR Nanao Line to Hakui or Minami Hakui Station. Chirihama Beach Drive Way is located in Hakui City, Ishikawa Prefecture. It is 8km long beach with great view of the Sea of Japan. This is the only beach where you can drive your car. Driving on the beach and see the great sea of Japan is fantastic. 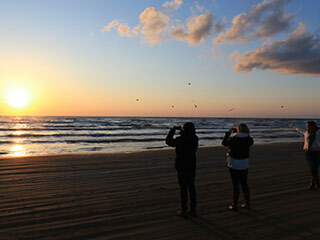 You can enjoy a great Sunset into the Sea of Japan. There are many temporary Bar and Grill that you can have fresh seafood.